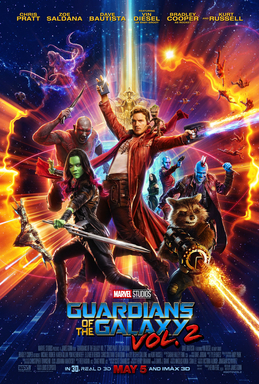 After the massive success that was the first Guardians of the Galaxy, Marvel Studios actually moved up the original release date for its sequel by several months. Writer/director James Gunn began working on the film mere months after releasing the first Guardians of the Galaxy, and pretty much every major actor in the movie returned. At the same time, Gunn wanted to aim for a generally smaller cast for the second movie, to make it more character focused. Marvel also pretty much gave him free reign on the sequel. Although he wanted a smaller cast, he did originally plan on adding both Mantis and Adam Warlock. He eventually decided to remove Adam Warlock from the script, saying the film got too busy. Speaking of Adam Warlock, Gunn said “I adored what we had done with him. I think we did something really creative and unique with Adam Warlock. But it was one character too many and I didn’t want to lose Mantis … Mantis was more organically part of the movie anyway.” Of course they still hinted at Adam Warlock’s creation in one of the many post credit sequences, and Gunn did say they could easily bring Warlock into future movies. Apparently he received a bit of blowback from Marvel for that teaser, as they worried that the teaser would convince fans that Adam Warlock would be in Infinity War and Endgame, which apparently he isn’t. He also commented that from the start, he wanted the second Guardians movie to reveal Peter Quill’s father. He wrote Quill’s full backstory while working on the first movie, and that he teased Peter’s father at the end of the first movie for a reason. It’s also worth noting that the sequel only takes place a couple months after the first, which means that while this is technically a Phase 3 movie, it takes place during the Phase 2 era, the same way that this month’s Captain Marvel takes place during the Phase 1 era. Speaking of the title, Gunn didn’t just want to call the movie “Guardians of the Galaxy 2” but at the same time, adding more words would make a long title even longer. Considering the “Awesome mix tape” was a major part of the first movie’s tone and Peter Quill’s personality, Vol 2 is probably the best middle ground. I get why Marvel Studios liked the title. In addition to the first movie’s main cast, Vol 2 added a couple new cast members. Several people were in negotiations to play the villain, including Matthew McConaughey. McConaughey eventually turned down the role in favour of The Dark Tower, saying that he would have been “an amendment” in Vol. 2 in “a colourful part made for another big-name actor.” Meanwhile, Kurt Russell entered early to portray Starlord’s father. It was also revealed shortly after David Bowie’s death in January 2016 that Gunn considered making Bowie a part of Yondu’s crew. In the meantime, French actress Pom Klementieff was cast as Mantis. Fun fact – they actually struggled to find props for the cassette decks and headphones used in the films. All of the Sony Walkman headsets they sourced for the film were broken, and Sony didn’t have any of the classic headsets available for filming. The three pairs they found on eBay cost nearly $2000, and none of them were the right model. The crew eventually built a bunch of new ones for scratch. Also, Vol. 2 was the first film ever shot with the new Red Weapon 8k cameras, which filmed the movie in 8k resolution. They actually decided to use it when only one working prototype even existed, and they spent 3 months working with Red Digital Cinema Camera Company to get more of them ready. One last fun fact. While filming Stan Lee’s cameo for the movie, Gunn filmed several other cameos, including his Doctor Strange cameo, to help limit the traveling he needed to do. Anyway, Guardians of the Galaxy performed well in more ways than one. It out grossed the first movie within three weeks, and ended up earning $863 million on a $200 million budget. Its home media destroyed the competition, enjoying the largest digital opening of any Marvel Studios film up to that point, and the physical release sold more than 3 times as much as the rest of the top 10 sellers combined. In Britain in particular, Vol. 2 outsold the other top 40 combined. After rewatching Vol. 2 and thinking about it hard, I agree with the Variety reviewer (at least on those quotes – I didn’t read the full review). Guardians of the Galaxy Vol. 2 feels like it has all the right elements to be an even better movie than the first one. Like the first, it’s got some very good dramatic moments. It does a good job at exploring Peter Quill, Gamora and Rocket Raccoon on a deeper level. It even gets you to understand Yondu better. It’s also a very entertaining movie. That said, it really feels like Gunn was trying too hard. A part of me wonders if that’s because of the pressure to somehow top the first movie. But it feels like it’s both trying to be more entertaining and more dramatic at the same time. It’s to the point where the comedy occasionally gets in the way of the more serious moments, and vice versa. Drax, who was a great character in the first movie, kind of feels like he’s been reduced to a comedic role. As cute as Baby Groot is, there are several scenes that focus on him for a bit too long. Most notably the scene where Rocket and Yondu are in a cell together, repeatedly trying to get Groot to grab an item they need. The first couple of times Groot grabs the wrong thing, it’s funny, but after a while the scene starts to feel stale. And as fun as it is to watch Baby Groot dancing during the opening sequence, it gets in the way of what should be an awesome fight scene. What does consistently work in this movie is the deep exploration of Quill’s past. Chris Pratt really nails the half/earthling this time round. You fully understand his very complicated reaction to finally meeting his father. You empathize with his initial doubt and mistrust. You understand him growing to love his father and enjoying his time on planet Ego. And of course his very quick snap to rage when he finds out what actually happened to his mother is completely believable. Yondu turning into his real father figure felt a bit forced, but at the same time, you get why Peter Quill and Rocket Raccoon are saddened by Yondu’s passing. On that mark, this movie does a brilliant job developing a friendship between Rocket and Yondu. Mantis is a good addition to the group, with just the right level of enthusiasm for life and being naïve regarding how normal people interact. Nebula also gets some great character moments too. But like I said, the movie’s biggest problem is that the comedy often gets in the way of serious moments. That was no more clear than the final action scene, where you spend several minutes watching Rocket trying to explain to Baby Groot which button to press on a bomb, and asking if anyone’s got any tape. Like Groot’s fetch quest, this would have been much better if it was done in half the time, or at least intercut with footage from the actual battle. That’s not the only example of excess comedy getting in the way of the climax’s action, but it’s the most notable example. All those criticisms aside, Guardians of the Galaxy Vol. 2 is still a good, rewatchable movie. If it was more even in tone, the simpler story, deeper character explorations and bittersweet ending could have made for a superior sequel. It’s also a good thing that Vol. 2’s story feels very different from any MCU movie we’ve seen before or since. My thoughts are, perhaps this movie could have benefited from Gunn taking a few more months off to gather his thoughts and relieve some of the pressure before diving in head first. Next up is Spider-Man: Homecoming, a movie I didn’t actually see until not only about a year after it came out, but several months after I bought the Blu-Ray. I’m still not sure why I waited that long, or why I’ve still only seen it once before, but I look forward to rectifying that. Afterwards, it’s Thor: Ragnorok, Black Panther, and then Avengers: Infinity War. We’re almost caught up with the MCU already and it feels like I’ve only really begun. That’s how you know that overall, the MCU is a very strong catalogue of movies. This entry was posted in comics, movie review, movies and tagged adam warlock, baby groot, bradley cooper, chris pratt, dave bautista, drax, drax the destroyer, ego the living planet, gamora, groot, guardians of the galaxy, guardians of the galaxy vol. 2, james gunn, kurt russell, mantis, marvel cinematic universe, marvel studios, mcu, mcu movies, peter quill, pom klemantieff, rocket raccoon, sci-fi, sci-fi movie, science fiction, stan lee, star lord, superhero movies, vin diesel, yondu. Bookmark the permalink. I agree, Guardians of the Galaxy 2 is a still a fun and exciting movie, but there’s just not quite the same magic as the first film. Its a hard one to pin down. It just feels a bit overstuffed, with plotlines, characters, and visual effects all jostling for our attention. Still a good MCU film, but not one of my personal favourites. After watching it again and carefully thinking it over, I’m pretty sure it’s because the comedy gets in the way of the action and drama, and there are even a couple moments where the drama gets in the way of the comedy. Toning both down and letting moments breathe would probably have been enough. Simplifying the subplots would have helped a bit as well. Agreed, GOTG2 is a bit of a jumble of conflicting elements, and that’s what makes it feel a bit unbalanced.